In case you haven't heard, Harper Collins is offering discounted e-books to kick start your summer reading. For the month of May, they are offering 12 e-books for just $2.99 each. 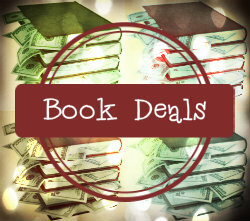 To get in on the deal, simply pull these titles up as you normally would on the e-reader of your choice! For more information, you can check out Harper Collins' Facebook page. I bought a few of these, and I can't wait to read them. I loved Ninth Wife!